Studio Rooms are available in two themes. The Malaga Studios are located on the 2nd to 5th floors of the hotel and are available in color combinations of deep sea blue, rust, dark gold and olive green. 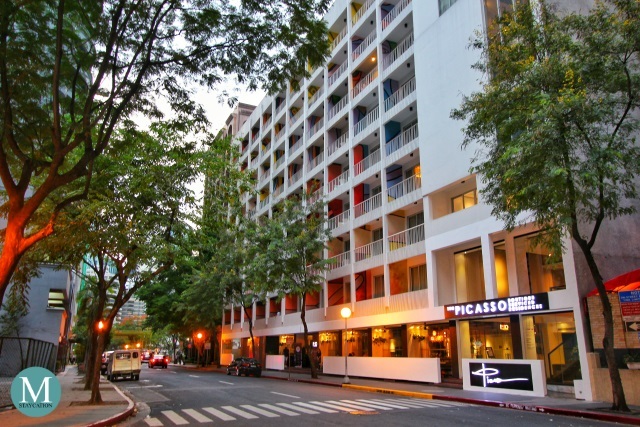 Located on the higher floors from 6th to 9th are the Madrid Studios which are available in color combinations of dark beige, royal blue, red and gray. 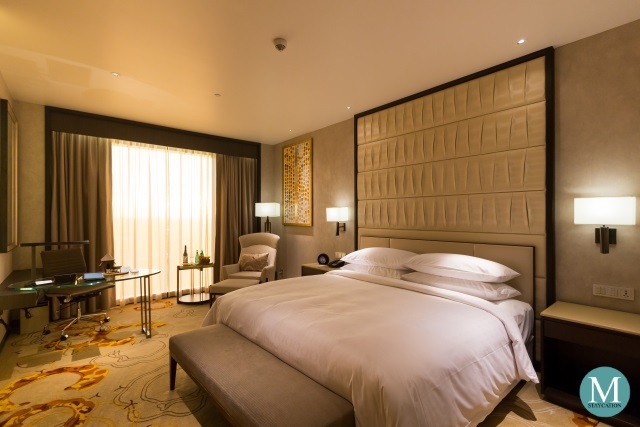 Elements of Cubism art which we saw on the lobby are also expressed in the Studios with rectangle, triangle and diamond shapes found not only on the furniture, but also in the art pieces that serve as wall accent and bed runners. 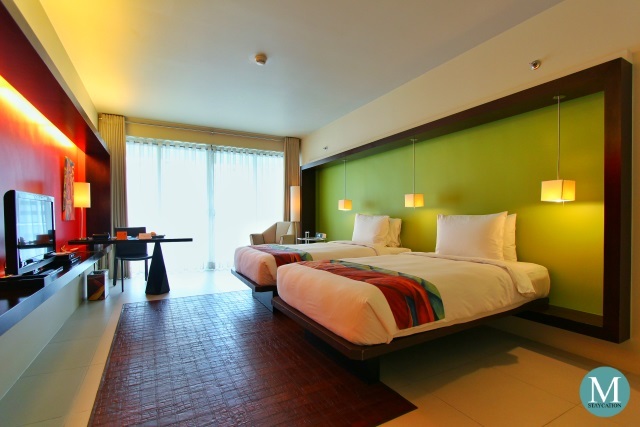 Studio Rooms at The Picasso Makati are also available in two bed configurations. 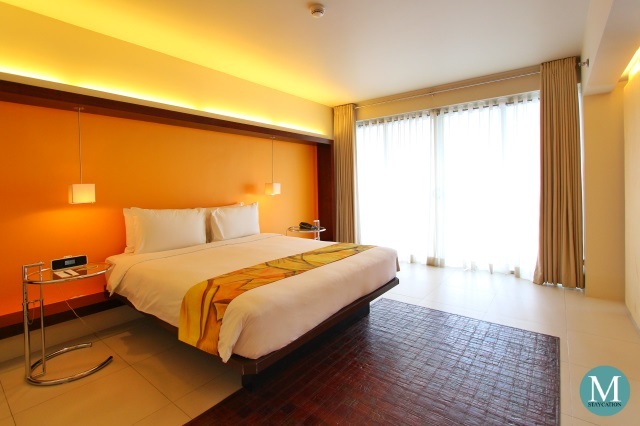 Guests can either book a studio with queen bed or a studio with twin-beds (check room rates). 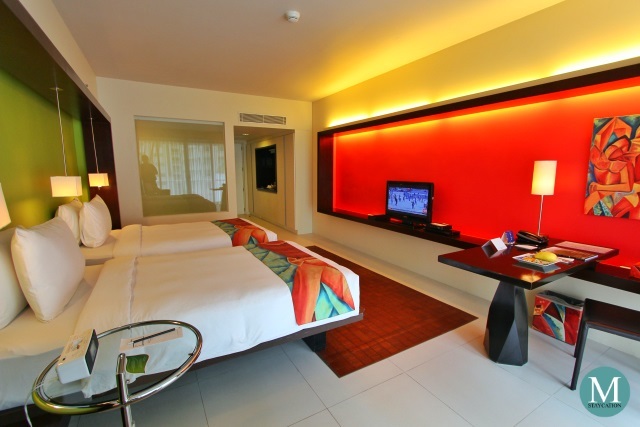 In addition to the bed, Studio Rooms are also furnished with a study area which can also function as a dining table. There's also a sofa and a bedside table. Every Studio Room has its own veranda with a view of either Leviste Street or the quieter Soliman Street. Arriving guests will be welcomed in their rooms by a plateful of fruity treats. 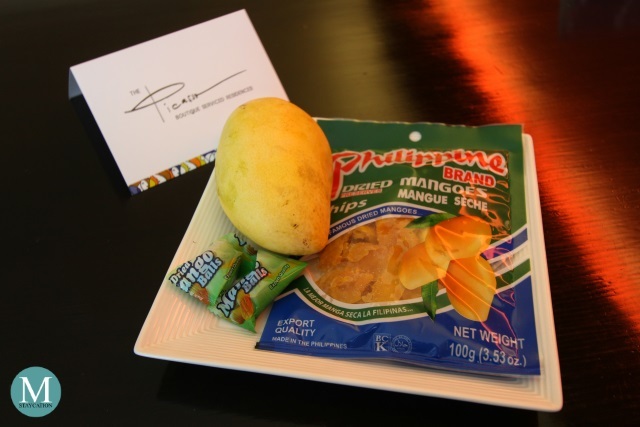 During our recent stay, the welcome amenities included a fresh mango, a pack of Philippine-made dried mangoes and two pieces of dried mango balls. They also came with a personal note from The Picasso Makati team. The room was already pre-cooled in anticipation of our arrival. The Studio Room is equipped with an individually controlled air-conditioning unit. 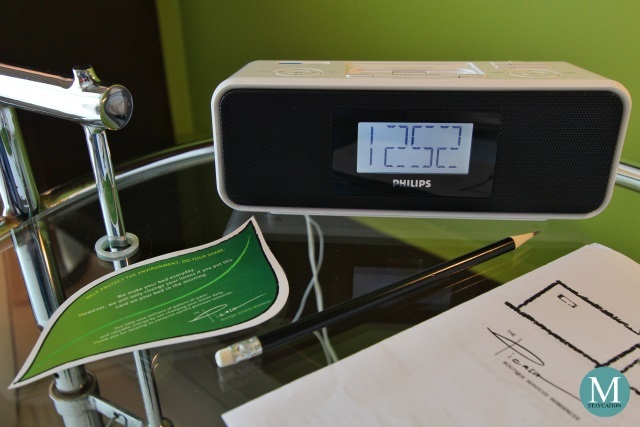 There's also an LCD TV with local and international cable channels as well as a bedside clock radio which also functions as an iPod dock. High-speed WiFi Internet connection is also available inside the Studio Rooms so that you can stay connected during your staycation. 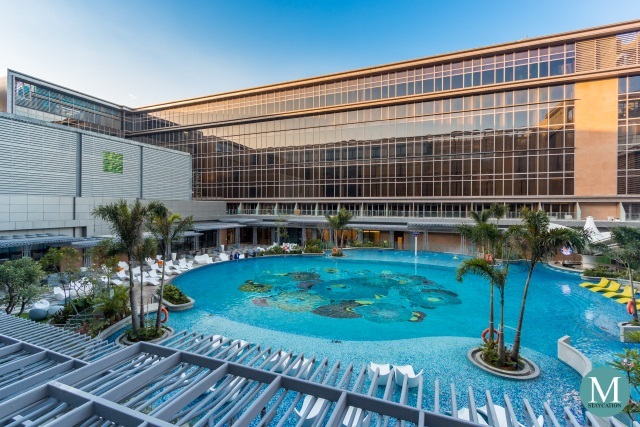 Please make sure that you ask for the username and password upon check-in at the hotel. 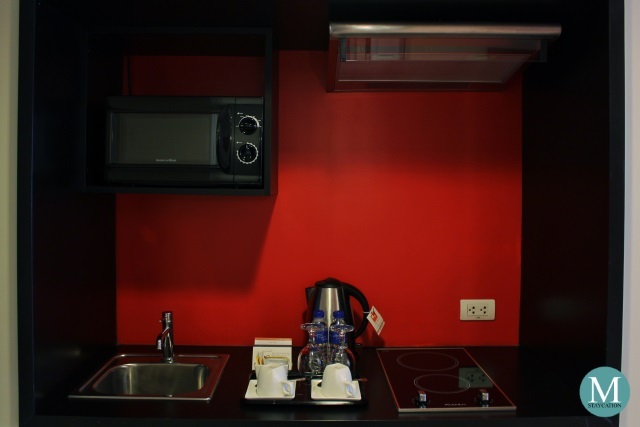 Being a serviced residence, every Studio Room at The Picasso Makati has a kitchenette equipped with a mini refrigerator, an electric stove, a microwave oven, and an electric kettle. There's also complimentary bottled water which guests can heat to make coffee or tea. Other residential amenities such as rice cooker, cooking utensils, dinner plates, spoon & fork sets, glassware, iron, and ironing board are also available upon request. The ensuite bathroom is equally spacious and clean. There's a single basin with marble countertop. 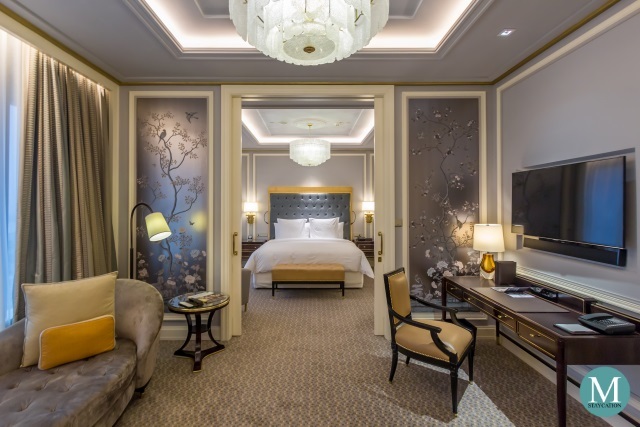 The area is well-lit and is mounted with a full-length mirror on one side, and with a framed window on the other. 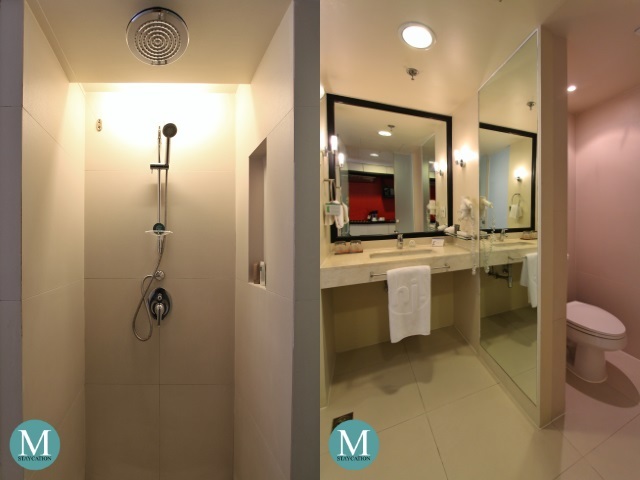 There's a separate walk-in shower equipped with a handheld showerhead and a rainshower head mounted on the ceiling. Water pressure is excellent while water temperature is easy to regulate. There's also a separate cubicle for the toilet equipped with a bidet. Studio Rooms do not have bathtubs. If a tub is a necessity for your staycation, then the Suite Rooms are the perfect choice for you. High quality cotton towels such as bath towels, hand towels, face towels and foot towels are provided. 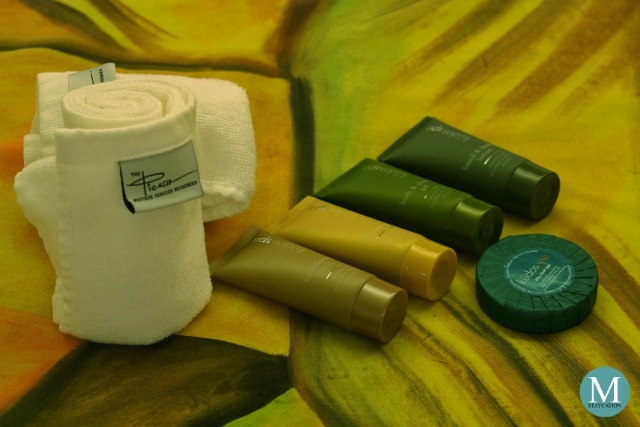 Every shower uplifts the senses with the Kudos Spa branded toiletries by Concept Amenities, an Australia-based supplier of body and bath amenities to the hospitality industry. The set includes Cleansing Shampoo, Hydrating Conditioner, Bath & Shower Gel, Hand & Body Lotion, and Cleansing Soap, all made with Cucumber and White Tea extracts and with fragrances of Bergamot and Green Tea which we truly love.